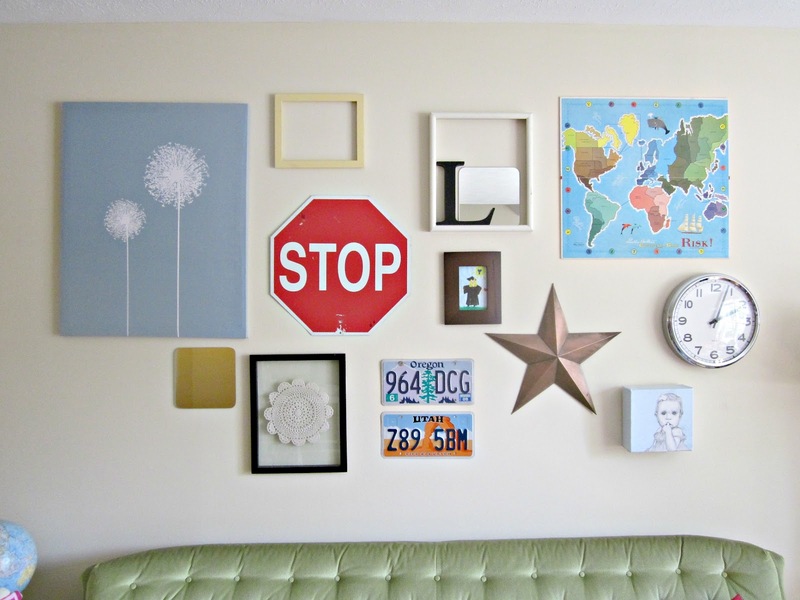 Creating a large collage on your wall can be a great way to collect a few of your favorite things and showcase them together. The uniqueness is part of what makes art collections like this so fun, so obviously every collage is different. 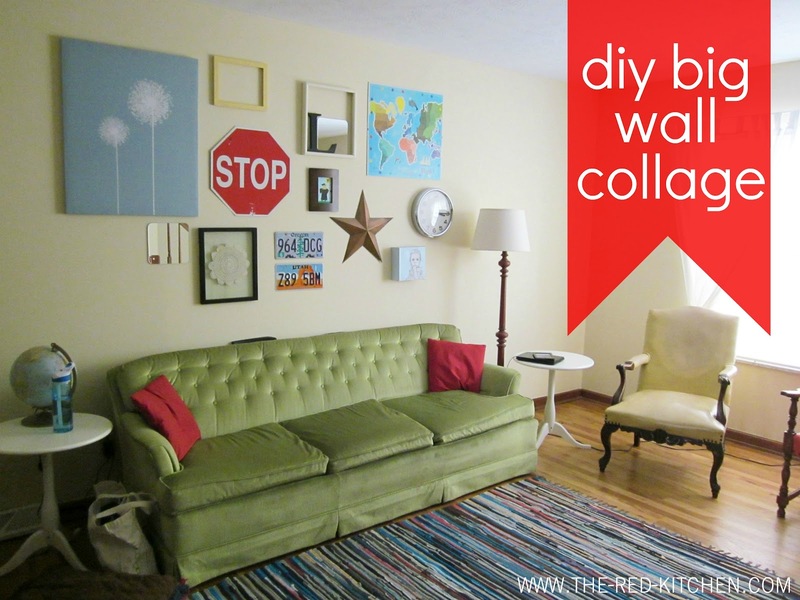 Today I'm just going to walk you through a few general steps for creating your own large wall collage and give some pointers about what worked for us. For more details about the items in our collage, see yesterday's home tour. Details and DIY after the jump! Before you can create a collage, you need to collect the items you want to include. Is the collage going to have an overall theme (beachy? athletic? gold and glam?) or just be a hodgepodge of things you like? Go with your gut instinct. If it's going to take up an entire wall, it should be things you love! Try looking for things in different shapes, textures, thickness, etc. to make your collage more interesting. And remember to think outside the box. It doesn't have to be "art" or be in a frame for it to work on the wall. Be creative and have fun! Once you've gathered up all of the items you want to include in your collage, start playing around with arrangements. ...But how? Trying to arrange things ahead of time and plan a layout was what kept me from doing a collage for a long time. At first we tried just holding things up next to the wall, which is obviously impractical (and so tiring!). Clear the floor in front of the wall where the collage will be and find the invisible center line that will go through your collage. 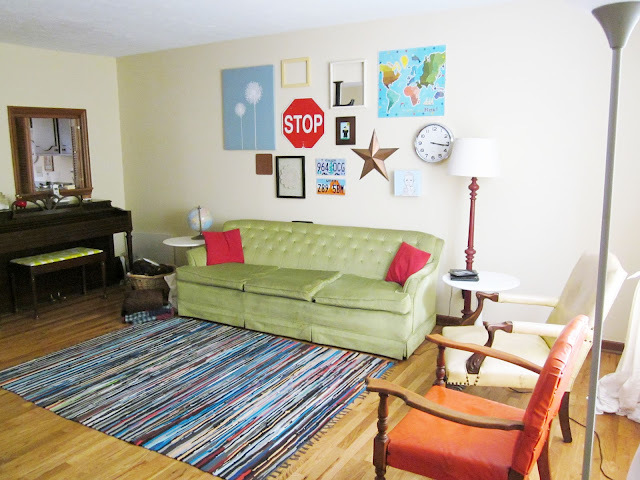 We knew our collage would be centered above our couch, so as we laid things out, we kept everything centered by checking it against the position of our couch. If you're also going to center your collage off of a piece of furniture, make sure that furniture is exactly where you want it to be long-term before you start! 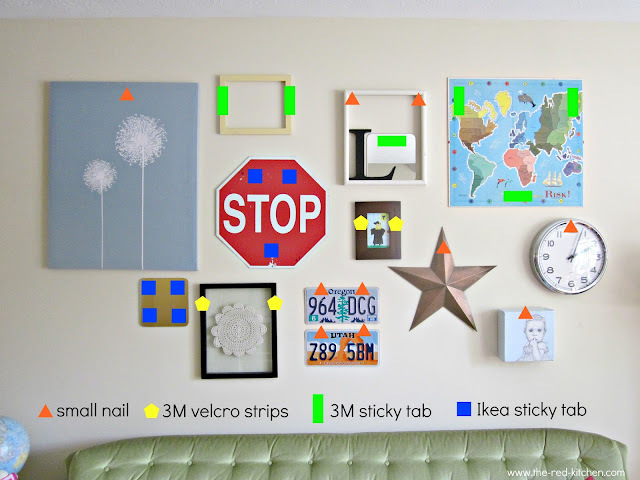 Start arranging your things on the floor the way you'll want them to be on the wall. Pay attention to spacing. It can be helpful to imagine a kind of bubble or invisible frame around each item. Having somewhat uniform spacing between each item in the collage is part of what helps mismatched items look like a cohesive whole. Rearrange! If you like things arranged exactly the way they are on your first try, then great! But if something just seems slightly lopsided or not quite in the right place, don't be afraid to keep playing with it and moving things around. After all, it's your wall! It should look right to you. So just keep switching things out and tweaking the spacing and the layout until it looks just right. This can be a bit of a process (and kind of a pain! ), but it's much easier to do it while things are loose on the floor. Once nails and adhesives start getting involved, it takes a lot more time and grunt work to get things right. Take a picture. Once you have everything arranged just so, grab your camera and take a picture. Make sure to include the entire collage in your picture. If your collage is large, you may need to stand on top of a chair or ladder (or, in our case, the stairs) in order to get a picture of your entire collage. Alright, everybody have a buddy? Because you're going to need one. Hanging a large wall collage is definitely a two person job. One person to hold things up in the right place and another person to look at the picture you just took on the camera and say, "Eh, no. A little to the left." When you're ready to start hanging your collage, only take items out of your "floor collage" one at a time and work from the center out. This way you can make small adjustments to spacing (if you need to) as you go without ending up with a collage that's off-center. And if you're working around a piece of furniture, it may be best to start from the bottom-center of the collage. (In this case, the licence plates.) That way you won't have to squish things down too close to the furniture. As for how to hang everything up, well, there are several ways to do that. The things in our collage are hung with a variety of simple nails and adhesives. Probably the best way to explain this is to give you some specific examples, so let's do that! In the above photo everything is labeled according to how it's hung on our wall. Small Nails (marked by orange triangles): These are just your basic small nails from the hardware store. I just found our box of small nails and it's Grip Rite brand, size 4d 1-1 1/2" (3.81 cm). Just hammer them in and hang the item on the nail! Just be careful about pounding nails into plain drywall. I'm no expert here, but I know that nails should really be hammered into wood for them to be secure. I think my construction management husband would back me up on that. 3M Velcro Strips (marked by yellow pentagons): Okay, these are actually called 3M Picture-Hanging Strips*. (Probably because Velcro is a trademarked brand. But I'm referring to them as velcro strips because, let's be real, they look like velcro.) Basically these are a basic 3M sticky tab (see below) with a piece of plastc-y velcro** stuck on top. You'll need two sticky tabs with velcro backing for each spot where you're going to attach one. This is awkward to explain without physically showing one, but from wall to frame, your layers will go like this: wall-sticky tab-velcro backing-velcro backing-sticky tab-frame. The sticky parts attach to the wall and frame. The velcro parts smoosh together to keep things in place. These velcro sticky tabs are great for larger items like heavy frames. 3M Sticky Tabs (marked by green rectangles): According to Amazon these are technically called 3M Command Poster Adhesives. They come in a short size and a long size. Both the short and long sizes are the same width. These sticky tabs work well for hanging 3M hooks (sold separately or in packs with the sticky tabs) or on their own. Each sticky tab is basically a piece of double-sided tape on steroids. They stick really well (both to the wall and to the item they hold up) and they come off cleanly. (Just make sure you pull straight up or down, not just away from the wall.) To hang an item with the 3M sticky tabs, just adhere one side of the sticky tab to the item you're going to hang. Then remove the paper on the other side of the sticky tab and stick the item on the wall. Super easy. Ikea Sticky Tabs (marked by blue squares): These were some kind of trash-looking adhesive squares (sorry, Ikea) that came with the pack of mirrors we bought from Ikea. I am very skeptical about these coming off the wall without leaving residue, but they came free with the mirrors, so we used them. I haven't tried removing any yet, so... no advice on this yet. Anyone else know how these do? *I am not being compensated by 3M for anything I say in this post. (Though I wish I were!) We've just used 3M sticky tabs, hooks, and the velcro stuff a ton and we really like them. **The plastic velcro parts are reusable! So if you use some and then decide to move something, take off the sticky part (that can only be used once) and reuse the velcro part later by simply adding another basic sticky tab to the back. Umm... it'll make sense when you're looking at them. Trust me. Obviously different methods of hanging are better for different things. The sticky tabs are great for hanging flat things that don't have holes for hanging. The nails are great for hanging things that stick out from the wall or that already come equipped with hanging gear. Well, that's it! In a nutshell, all you really need to do to create a great wall collage is collect your items, lay them out on the floor to get your arrangement just right, and then hang them up! It's not rocket science. It's just one of those things you figure out as you go. So if you've been itching to make a big statement and showcase some of your favorite things, go for it! Maybe we'll look into using some velcro strips and such when we hang stuff. So far the only holes we've put in our walls have been major screws going into the studs to hang shelves...but eventually we'll get to hanging cute stuff on the wall.